Group H – Cheap Bakkie Rental with lowest excess in town! Get the Nissan NP300, Long Wheel Base, 1 tonner with canopy and towbar at crazy prices. Pace Car Rental also stock bakkies on our fleet. This is for the clients wanting to rent light commercial vehicles and trucks for hire. Pace Truck and 4×4 Rental offer a range of closed and open, bakkies and LDV’s for commercial, leisure and domestic use. So, if your business has a need for an extra bakkie or drop side truck call us today. We have chosen the 1 Ton long wheel base bakkie as our standard vehicle, and canopy is included on request. This vehicle can be driven with a Code B license. We are able to assist with all requirements and have vehicles that are more than fit for purpose. Our high top bakkies / vans are fitted with igloo canopies which make for the best loading capacity. This due to the fact that the load box is raised and therefore one does not see the wheel arches on the vehicle. 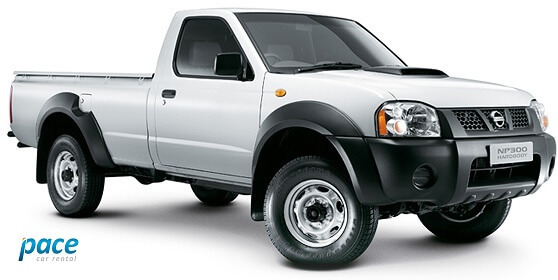 Our vehicles are ideal for when you want to rent a bakkie. We have long wheel base light commercial vehicles for rent with 2 x 4 capability and strong engines to ensure that they can carry the loads that you are looking to carry. In general we would prefer that the business renting the vehicle opened an account with us so that we can bill on a monthly basis. On accounts we expect payment on statement. For commercial renters looking for affordable long term bakkie rental we can set up long term bakkie rental rates and ensure that you get the right vehicle at the right price. Pace – Be part of the Pace Inavsion.